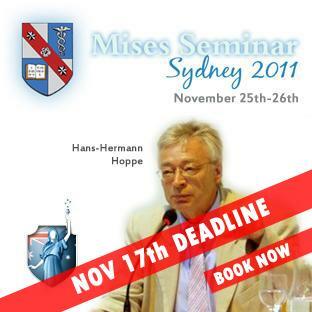 Professor Hoppe was the keynote speaker at the recent, very successful Australian Mises Seminar, 25-26th November, 2011, held in a private club in the Sydney CBD. Various posts about the event, and the videos released to date (which are in 1080p HD), are linked below. My Journey to Anarchy: From political and economic agnostic to anarchocapitalist, Neville Kennard.